Autism is a disorder seen in children of less than 3 years. It is a brain development disorder. Social interaction and communication are seen to be affected in this disorder. It is strongly related to genetic factors. Rarely is it associated with agents that cause birth defects. 0.1 to 0.2 percent people are found to be affected by this disorder. About 0.6 percent suffer from autism spectrum disorders. In autism, many parts of the brain are affected but it is not known how it is affected.There is no sickness, emotional disturbance or fragility.The sufferers of autism may range from severe disorder like silent and mentally disabled to the disorder of mild magnitude where patient is active but socially odd with limited interests and verbose. Parents of the child suffering from autism experience high stress. The symptoms of autism may be moderate or severe. * Absence of language by 15-30 months. * Disability for development at the age of 15-30 months. * Impairments in social interaction. * Restricted interests and repetitive behavior. * Less attention to social stimuli, they rarely smile and look at others. * Most of the times do not understand their name and that they are addressed. * Autistic toddlers look less into eyes and communicate by manipulating another person's hand. 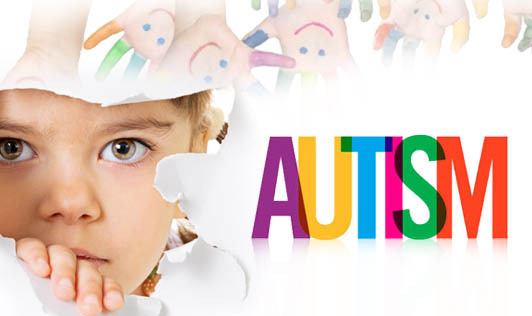 * Children of 3 to 5 years age with autism disorder have less social understanding. * Hesitate to approach others, do not imitate and respond to emotions. * Cannot communicate nonverbally, and do not take turns with others. * Aggression, destruction of property, and tantrums are seen in children suffering from autism. * They cannot speak enough to accomplish their daily needs. * They rarely request or talk about their experiences, and most of the times use words used by others. * There is no joint attention for fruitful outcome in discussion. * They are attached to parents or people looking after them. * Autistic children like to stay with other people. * There is a co-existence of motor problems like toe walking, poor muscle tone and poor motor planning but the extent of motor disorder is not severe. * In some cases the child seems normal till the age of one or two years but later on the symptoms of autism are seen and the pre learned skills are also lost. This is called as regressive type of autism. * More sleep problems are seen in autism children. They may frequently awake in the night and early mornings. They may also have problem of falling asleep. The characteristic triad of symptoms is presumed to be ascribed to genetic, cognitive, and neural levels. However, the core aspects may have different causes but coincidently they do occur. It is not clear that autism spectrum disorders are due to multigene interactions or due to minor mutations causing major problems. In a number of autism patients there are some genetic causes that are not passed on to the next generation but could have been easily passed. It means that the mutation responsible for autism is absent in parent's genes. * The exact mechanism behind autism is not clear as to whether it is at a system level, cellular level, or at molecular level. * Developmental factors are found to be behind autism affecting some or all functional systems of the brain. * The size and weight of the brain is found to be larger in autism. * Poor regulated immune system together with symptoms is seen in autistic children. * Abnormalities related to transmission of neural signals are found in autism. * Higher levels of serotonin are noted. * Boys are at higher risk for autism than girls. * Parent's advanced age at the time of conception. * Birth defects causing agents specifically attributed towards autism act during first eight weeks after the conception.It does not mean that autism is not initiated or affected later. It arises in early stages of growth. * Neither the MMR (Mumps-Measles-Rubella) vaccine nor the preservative for the vaccine, thiomersal cause autism. * There may be an association between several other disorders and autism like genetic disorders, mental retardation, epilepsy, metabolic defects and other minor physical anomalies.